Our closets can be compared to our souls. and keep the wardrobe that is best-fitting. and did you know that it talks about closet organizing in the Bible? and grabbing whatever attracts your fancy. bad temper, irritability, meanness, profanity, dirty talk. The job of organizing your closet doesn't end when you've organized your clothes. ties, scarves, handbags, hats, belts and shoes. The closet that we are looking at today is in a client's home. so she has another, larger clothing closet to the right of this one. This closet is mainly used for items she uses occasionally, not daily. Took everything OUT OF THE CLOSET and eliminated everything that wasn't worn within the past year. We were ruthless! 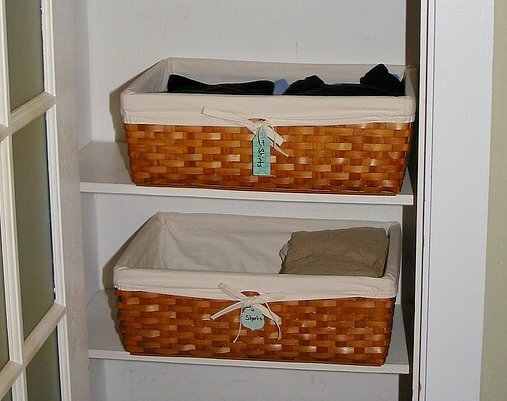 Put the items back in the closet inside baskets or bins or on hooks. This is helpful, so you can just grab the basket/bin you need, and not have to dig around for something. Over-the-door hooks are excellent organizers, especially for a small closet, like this one. Brought in only the smallest baskets that were needed, so she wasn't tempted to fill it up with more stuff she didn't need which is why we were organizing the closet in the first place. Added cute label/tags tags to the sides of the baskets. A draw-string, just-for-dry-cleaning bag is placed on the floor. 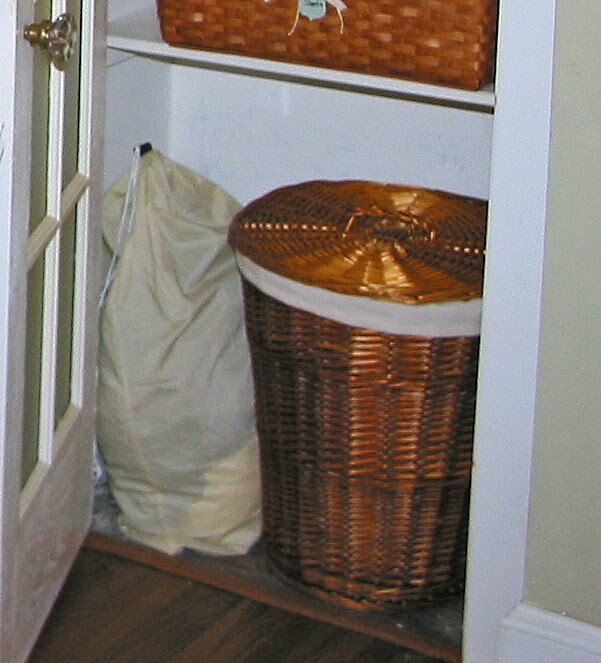 A lined hamper with handles is handy to take to the laundry room. This closet's space is limited, so for each new item put in, one item must go out. I confess I need to rid my closet of the ill-fitting clothing of irritability and selfishness. They need to be thrown out. Which "old fashions" do you have that you need to get rid of? Let's purge. Let's be ruthless! Oh man you were speaking to me when you wrote this post! I not only need to clean in real life but in my soul life as well. I haven't been reading the Bible regularly and I can feel it in the way I am as a mother...the way I am as a wife..etc. Thanks for the reminder! Beautiful! Transformation on the inside allows for the transformation on the outside too!!! What a wonderful post!!! That is sooo what needs to happen 'round here. Maybe I will just tackle my closet this weekend. Thanks for the inspiration! Ok, I have tried five different times today to comment here...Blogger won't let me! Grrr. What a great post. As we have just moved into a "new" house that is 60 years old, there are no closets...storage and organization are a challenge. I am having to be creative in the ways that I store things, and it can be fun to figure out! In my spiritual life...God has really been working on my to "clean out the clutter" and it is hard and freeing all at the same time! I also want to thank you for all of your faithful comments...I so look forward to reading them, they encourage me so!